The British newspaper the Telegraph offers an obituary of famed espionage author and journalist Chapman Pincher, who recently died at 100. 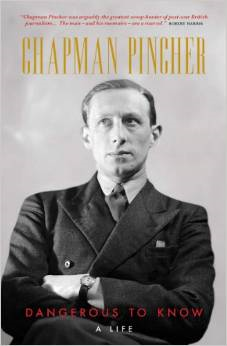 Note: I happen to be reading Chapman Pincher's Treachery: Betrayals, Blunders, and Coverups: Six Decades of Espionage Against America and Great Britain when I heard of his death. Treachery is an amazing book. Not just his research, but that he could write such a difficult and long book in his late 90s.